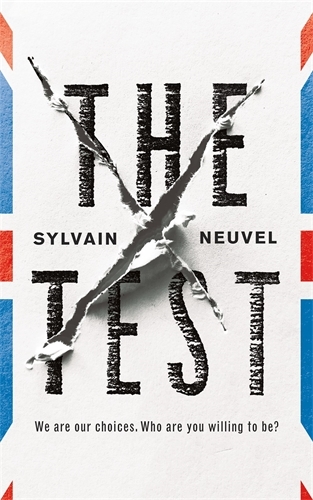 Canadian author Sylvain Neuvel’s new novella, The Test, is a long way removed from his engaging trilogy of novels about alien invasion and giant robots (Sleeping Giants, Waking Gods and Only Human). The Test is a Black Mirror-style concept which posits a fairly extreme form of British citizenship test. The Battle of Bosworth Field was fought in… 1485. I am positive. That is the answer. I wonder who writes these questions. How will knowing this make me a better member of British society? My son has no memory of Iran and my daughter was born here. We have been asked many times why we hate freedom, told to go back to the desert many times … but not once has anyone asked me about famous battles of the fifteenth century. This can’t be happening to us, not again. This is what we ran away from. Guns and impunity. This is why we’re here. Men with guns knocking on the door in the middle of the night. Kneeling. Always kneeling. Watching her leave, not knowing if she was coming back. It is soon apparent that perhaps not everything about this attack is what it seems. While the plot of The Test is a long way from his previous trilogy, Neuvel once again uses science fiction tropes to explore social issues and demonstrate a deep humanity. There are bad guys in this story, but they are not who the reader expects. There is consideration of how people act in stressful situations where every choice is a bad choice and where not deciding is a decision in itself. There are questions asked about what lengths countries might go to vet immigrants, the type of people who might run such a test and what impact a process that alienates people might have on their ongoing connection to the country they have sacrificed their home to be a part of. All of this seems especially timely. Neuvel plays on the idea that the terrorists are not the people seeking asylum but those who seek to demonise them. That maybe people seek refuge in countries like Britain or Australia or Canada not to bring violence with them but because they are fleeing violence and the use of arbitrary force. And that treating every immigrant as a potential terrorist gives the message to others that this is the way they will always be seen. At just over 100 pages The Test covers a lot of ground and packs a fair punch. It can and should be read in one gulp. And that is not hard, as Neuvel builds the tension quickly and creates a situation that demands a fairly quick resolution. It is a timely and fascinating change of pace for Neuvel, and increases my interest in where his next full-length novel will go. This review was first published on Newtown Review of Books.